I've already decided what my last meal in Tokyo will be: juicy, succulent tonkatsu (pork cutlet) enrobed in light, flaky panko (breadcrumbs), fried to a deliciously crunchy golden brown and served alongside a crisp pile of freshly shaved cabbage. Friends, I'd like to introduce you to one of my favorite Tokyo restaurants - and your next obsession - Tonkatsu Suzuki. Much like sushi or ramen, there are literally thousands of places serving tonkatsu in Tokyo - but I haven't found anyone who does it better than Tonkatsu Suzuki. Located inside bustling Tokyo Station, Tonkatsu Suzuki isn't fancy or exclusive. Ducking beneath the simple navy noren (fabric curtain) that marks its entrance, patrons are welcomed into a simple, bright open kitchen bordered by a long blonde wood counter. The best seats are found here - where diners can take in the chef's methodical frying process - but there are tables available should you be with a larger party. Like most places in Japan, Tonkatsu Suzuki's menu is centered around one dish: the glorious fried pork cutlet. Your biggest decision here will be whether to go for the fatty rosu (loin) or the lean hire (fillet). (Hint: go for the loin). Both come with bottomless servings of paper-thin cabbage shreds and perfectly cooked white rice, to accompany a flavorful bowl of clam miso soup and a trio of pickled vegetables. There's also endless green tea on offer, but keep in mind that fried comfort food pairs well with a tall frosty glass of nama biru (draft beer). Whatever your cut of choice may be, the next step is the same for everyone: douse your plate in ALL THE SAUCE. Sauce caddies, situated at every seat and table, house your typical dark and delectable Worcestershire-based sauce for the pork (and a spicy mustard for anyone who can't bring themselves to ruin the fluffy panko crust that was created with such care). But the real magic is in the cabbage sauce, of which there are two choices: sesame and yuzu (Japanese citrus). Truth be told I have yet to try the yuzu sauce as the sesame dressing still has me in its grip. I'd probably drink it, if that wasn't totally frowned upon. If you are visiting from outside Tokyo - or Japan, for that matter - it's unlikely that you'll need to go out of your way to dine at Tonkatsu Suzuki. Nearly every visitor to Tokyo is routed through Tokyo Station at some point - its 28 platforms see nearly half a million daily commuters in addition to serving as a main hub for those traveling to or from Narita Airport or via Shinkansen (bullet train). Feel free to roll into the restaurant with your luggage, as they've got a place to store it. It's worth noting here that you shouldn't worry about the long lines which plague the handful of tonkatsu spots that are written about in nearly every Tokyo guidebook. I've never waited more than 15-20 minutes for a seat at Tonkatsu Suzuki, despite the fact that it's the best tonkatsu I've found in Tokyo. If you're strapped for time at Tokyo Station, skip the sit-down meal and get an ekiben (train bento) from the restaurant's takeout counter. It's hard to put my finger on what exactly pushes Tonkatsu Suzuki above the rest. It might be the pork (I'd like to write that swine a love song). Perhaps it's the expertly fried downy panko crust (hats off to the chef). Or maybe it's that lip-smacking good cabbage sauce (totally guzzle-able). Whatever it is, I apologize in advance for the tonkatsu addiction that will surely follow your visit, because no other cutlet will come close. ***TIP: Kitchen Street is located on the first floor of Tokyo Station, near the Yaesu North Exit. 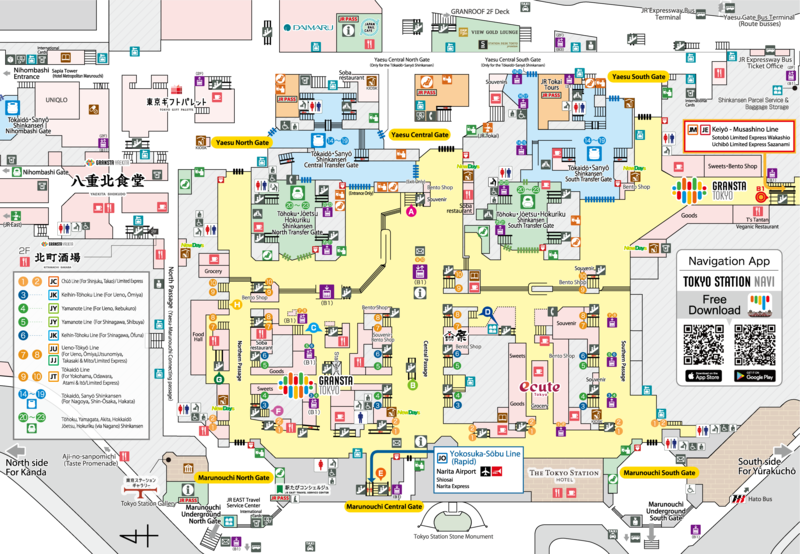 You can find a map of Tokyo Station here (note Kitchen Street on the far left). Hours: Open daily from 11AM to 11PM. Cost: 1,000 to 2,000 JPY (10 to 20 USD) per person. Credit cards and PASMO/SUICA (rechargeable transit cards) are accepted. Seats are on a first come, first serve basis. If the restaurant is full, an orderly line will be formed to the right of the entrance. English menus are available. Note: This article is available as a mobile app. Go to GPSmyCity to download the app for GPS-assisted travel directions to the attractions featured in this article.